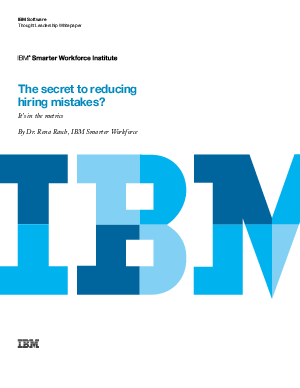 Research Library > IBM > The Secret to Reducing Hiring Mistakes? In the age of big data and workforce analytics, statistics and metrics abound. In the face of an overabundance of numbers, knowing which metrics are most important can be a real challenge for Human Resource (HR) leaders and hiring managers. Fortunately, new analyses from the IBM Smarter Workforce Institute can provide some guidance. The Institute explored which metrics organizations are using to evaluate their recruitment processes, and how those metrics impact hiring decisions.